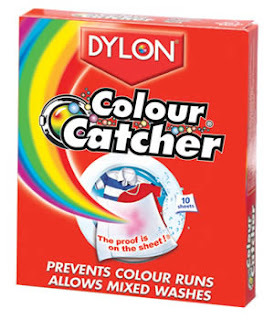 Dylon Colour Catcher Saves the Colour & the Day! Keeping your whites white and your colours bright can sometimes be harder than you think. Mixed washes – even accidental ones, do happen and whites can start to look dull after a while however much care you take sorting the washing. The simplest way to keep your clothes looking their best when washing is by using a specialist product and you can’t get better than the colour experts Dylon Range. It’s easy to see why their Colour Catcher and Ultra Whitener are so popular, and it’s hard to remember how you lived without them! Simply put Colour Catcher® works – every time you wash bright or dark coloured clothes, traces of dye bleed into your laundry. These dyes may completely ruin your wash or leave your clothes with a dull, grubby appearance. Colour Catcher® is a treated anti‐transfer sheet with special ingredients which act like a magnet, removing loose dyes and dirt during the washing process. A very good product. have used for several years giving me peace of mind when washing in the machine. Mixed colours no longer a worry and one can mix colours and whites and they truly come out in their original colour! I use one sheet in every wash ~ great for when others use the machine and think they are helping you with the washing ~ no worries if they mix colours. Very dependable! Now for your whites – regular washing can make your whites look grey, but using Dylon Ultra Whitener with it’s special whitener agents puts the dazzle back into your whites. It’s suitable for Machine Wash or Hand Wash. With 4 x 25g sachets per pack, it’s great value and means Brighter Whites for All the Family!